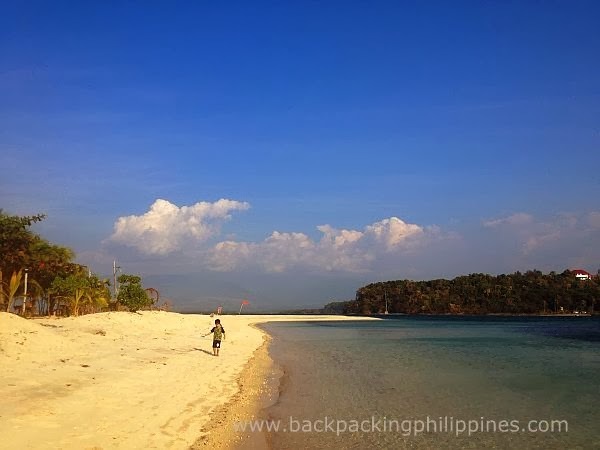 Magalawa Island, an island lined with white sand beach can be found in Palauig, Zambales. It's mostly divided into three parts, the first is settled by a small community of fishermen, the second is owned by a politician who owns Ruiz Resort and the third is by the Armada family who owns Armada Resort Magalawa Island (who claims to own the whole island which is disputed in court against the owners of Ruiz Resort). Overnight accommodations are available, latest rates posted on their official website. Snorkeling is included in the Magalawa Island itinerary and rates, including free use of snorkels, masks and even underwater pictures by the boatmen. Online map of Magalawa Island can be found here via OpenStreetMap. You can use Garmin GPS Navigators or iOS and Android apps (e.g. OSMAnd) to easily find the place. San Fernando, Bacolor, Guagua, Lubao in Pampanga, Dinalupihan (Bataan), Olongapo City, and the Zambales towns of Subic, San Marcelino, San Antonio, San Narciso, San Felipe, Cabangan, Botolan, Iba (the capital of Zambales), Palauig town proper. 2. After Olongapo City, you'll pass by town of Subic, Zambales, San Marcelino (the hometown of Ramon Magsaysay and where you can find vendors selling singkamas), San Narciso (you won't pass by San Antonio, where you can find Pundaquit, the gateway to Camara Island, Capones Island, Capones Lighthouse, Anawangin Cove and Nagsasa Cove) San Felipe, Cabangan, Botolan, Iba (the capital of Zambales), and Palauig. 3. After passing by the intersection of the highway and the road leading to Palauig town proper, you will pass by a zigzag road (twisties) then turn left to a corner. This road (mostly rough road) leads to the jump off point to Magalawa Island. Travel time here is around thirty minutes. 4. Enter the Armada Resort compound and park there, board the boat to Magalawa Island. lots of islands indeed to explore in Zambales!